Jeremy Solly (JS): Welcome to the HealthChangers podcast, presented by Cambia Health Solutions, where we share real stories of health care transformation from those experiencing it, and those helping to make health care more personalized. I'm your host, Jeremy. This episode features a recording of a live fireside chat at the Cambia Grove, a place that is a bridge between health care entrepreneurs and innovators and the larger health care institutions that want change. Health care and public policy are tied at the hip, and you can't have a productive conversation about health care innovation without talking about public policy. 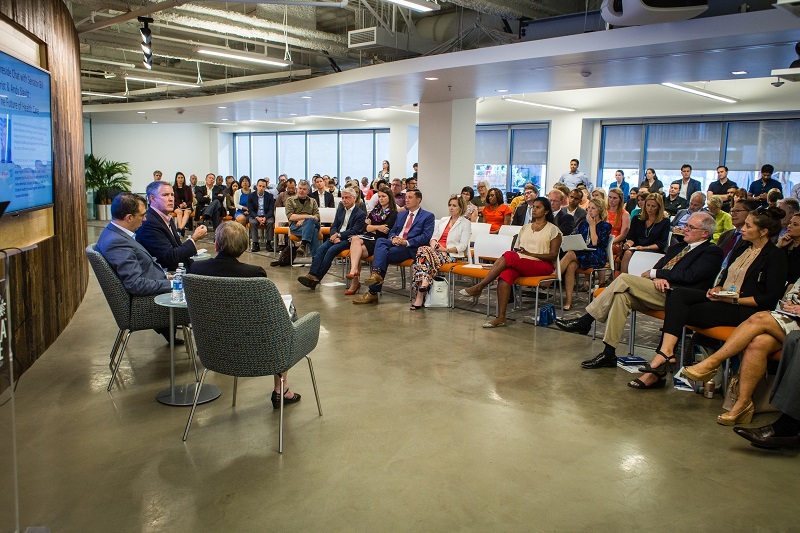 The focus of this conversation is the future of health care, and it features physician and former Senate Majority Leader Bill Frist, and Andy Slavitt who was the administrator for CMS responsible for implementing the Affordable Care Act during the Obama administration. To give us some context on the conversion, we invited Cambia's Senior Vice President of Public Affairs and Policy Sean Robbins to join us. His team organized this event with the Bipartisan Policy Center, and I asked him why Bill Frist and Andy Slavitt where invited to have this chat. Sean Robbins (SR): Well a lot of people don't remember, but back in the 90s, Senator Frist was actually the former Majority Leader during much of the Clinton presidency. He's also a physician and surgeon. So, he comes at the health care question from a practitioner and provider perspective, but one that is steeped in public policy. So, he's a really interesting person, and he has not only built his career as a surgeon and then as a policy maker in the senate, but also went on following his time in the senate and became a private sector business person who has built a pretty successful investment portfolio. Putting money where his mouth is, so to speak. Especially on the front of innovation, which is really a discussion we expect to have with him. Andy Slavitt is former CMS administrator for President Barack Obama. So, he brings the democratic counterpart, but from a “boots-on-the-ground” implementation of the Affordable Care Act perspective. That is pretty unique in coming off the last administration, particularly in the environment wherein we're having a national conversation about the Affordable Care Act. Andy Slavitt brings in incredible on-the-ground experience, and has been since the end of the Obama presidency a really outwardly facing spokesperson and defender of the affordable care act. So, the both bring a pretty tremendous portfolio to the table. JS: What are the key themes that we are about to hear from their talk at this fireside chat? 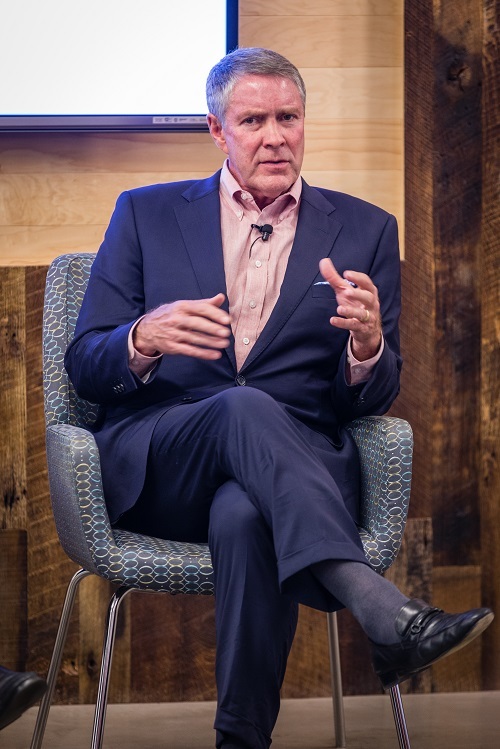 SR: You know, Senator Frist really seen a lot of companies a lot of pipeline, a lot of technology, a lot of entrepreneurs over the last decade, decade and a half particularly. He sees the world in large parts through a lens of innovation, but with that policy background and political background. Mr. Slavitt on the other hand is coming right off the heels of that administration. He's been a staunch defender of the Affordable Care Act. I believe that he really presents a perspective that the Affordable Care Act did a lot more that people gave it credit for at the time, and sees a private/public partnership as consequential and essential to moving health care innovation forward. I actually expect both Senator Frist and Andy Slavitt to share that common ground. SR: Thanks for having me. JS: Let's dive right in to the conversation. The moderator is Jan Berger President and CEO of Intelligence Partners. Jan Berger (JB): What's the advice you give this group today as we our all moving forward looking to improve health and health care in this country? Bill Frist (BF): You want to go, or you want me to go? Andy Slavitt (AS): Sure. I'll take a shot. AS: So, I think, it's really important that we decide how we are going to focus our resources to innovate, and here's what I mean. I've been overseeing Medicare and Medicaid. I can assure you, you can take this away, America's problems are not with 67-year-old joggers with two Fitbits. They don't need a third Fitbit, okay? America's problems are with the woman who lives two bus stops from her dialysis center, and probably two bus stops from her nearest groceries store. When she misses the second bus, or she has to miss work, she can go into renal failure and spend 100 days in the hospital, and the causes had very little to do with health care. With excellent and exciting news is that if we focus our innovation—not on product innovation in gadgets, not on buzz words like AI, not on things that necessarily investors are extremely excited about—but if we invest it where we are spending an awful lot of money for not a lot of good outcomes, frankly with people who are old or poor, and sicker, I can tell you that if everybody in the country had access to the same health care experience I have, we would be just fine. We would be just fine. So, we got to focus on the people who need the care that need it. Secondly, let's just put it on the table. We charge each other too much for health care. There's a lot of reason we do it, but we are stuck in the cycle of it. It's units cost. It's the cost of everything because I can tell you, I have heard from people across the country, I talked to them, and you have as well, who have gotten that prescription for their child and walked out of the pharmacy because they couldn't afford it. I've talked to a woman who takes her medication, her maintenance medication for mental health every other prescription and talks about her bad month. I've talked to people who had kids go into the RN hospital and how that's financially changed their lives for the next 14 years. A broken arm, 14 years. So, we charge each other too much. Some of the reason we do it is because health care is our job sector, and we are addicted to the jobs that it creates in this country. It’s a very hard cycle, but we have to figure out how to repurpose, and I think that's the third thing I'll say is, everything I see us do well is when we deinstitutionalize. It's when we take our people at home. It's when we unite families. It's when we give care and budgets over to families to take care of their families instead of institutionalizing them, and we begin to save money. We begin to get more humane, and that’s where technology takes me back to my first point because you need good technology and data to make that dream come true. So, I just want us to focus on the right places and bring that entrepreneurial energy there, and that's how we will start to make progress. "We fail, and that's where the innovation can be. It's going to happen though empowerment with the tools we didn't have before." BF: So, I'm a heart lung transplant surgeon, that's what I did, and I did it at a time when it really wasn't there. Nobody had ever done a lung transplant. Nobody had ever done a heart-lung transplant, but jumping into it at the time, and by getting the smartest people, and a willingness to innovate with the commitment of resources, today lung transplants are routine. Heart transplants are routine. So these things that similarly impossible can be done. Health care is complicated, and if you say we have to do it in the same way that we've done it, it's impossible. There's not enough money. There's too many, you know, 30 million, there's going to be 50 million people uninsured probably hear shortly. There's not enough money to promise everybody everything, and there's not enough money, if you say you have to deliver it in the same way. So, I think Andy, you are exactly right. We charge too much. But no doctor's going to say, "I'm going to lower my rates to save America," and that sort of thing, and no hospital is. 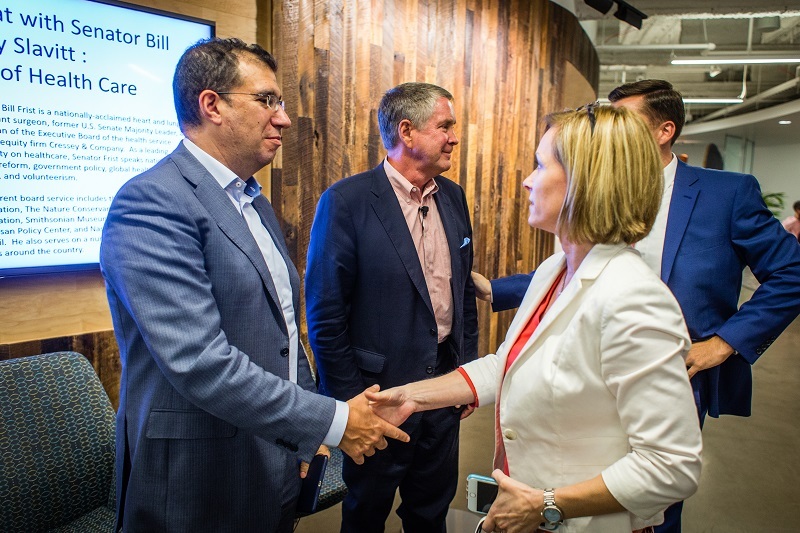 So, we’ve got to change the way we are doing business…and that is empowerment of individuals who consumer engage much in the way that gives them the information and the tools they need to shop wisely. To be smart. Two choices. Let them choose based on what is viable to them. I do a lot of work in the Southern Sudan and in many African countries, and no matter how poor people are they want dignity, number one. Number two, they do want to be able to choose what's best for their kids, and number three, they're willing to pay. If they can't pay for something, when they get better they want to go work in the field behind the clinic. So, we’ve got to get back to learn what other countries think in terms of community health workers. Not everybody has to be Bill Frist, heart and lung transplant surgeon, delivering health care. We need to use technology in a way, again that this part of the country sings in, is in telemedicine. You do not need to get in a car at 2 o'clock in the morning if you have a very bad allergy, or even bad chest pain, if the alternative would be to pick up the telephone with eight minutes, talked to a board-certified doctor in your state for a charge of $40, versus $2400 in the hospital. That takes change in the way we do business. You can't let doctors have these curtails, and say, "No. Telemedicine is going to stay out of Texas, until you establish a bricks and mortar relationship, and only then after that can we use it” when you have 80 percent of the counties there that have fewer than three primary care physicians, it can't be done. So, we'd like to think about how we do medicine, deliver medicine. Andy, I think he said it, America has led in terms of molecule, pharmaceutical, science, good innovation. We've excelled in imaging, and procedures, and devices. We are the world leader. We are the worst in where the 3 trillion dollars in health care, or the 2.3 trillion dollars are spent in delivery of how an individual accesses a hospital, a clinic, a telemedicine call, or nurse. We fail, and that's where the innovation can be. It's going to happen though empowerment with the tools we didn't have before. It is big data. I'm implying, Amazon, and Facebook, and Google. Want I really mean are the individual entrepreneurs who had in their head, and teams of people who are coming together with competition of how to make Alexa ... I have OK Google and I have Alexa. Alexa, I had to put way because my wife got so jealous of me calling "Alexa! Alexa help!" So, now I'm back on OK Google for that reason, but at the end of the day, that voice of what I need, versus going to a hospital, that immediacy is there through the technology. That has nothing to do with the United State Senate. It has nothing to do with Majority Leader. It has to be by changing the way we do business. Empowering 300 million consumers, and not 100 senators, to be playing. It does mean government has to take care of the vulnerable, has to have the social contract, has to empower, has to facilitate risk determination. I better stop. JB: It sounds to me like there's great opportunity outside of Washington as you said, in States, in communities. With that, I want to start by opening it up. Are there questions from our audience? Either virtual audience, or actual audience that would like to start? "Instead of just focusing on the services, getting people in and out, they're actually going at root cause. Root cause problems." Audience participant: This is really a question for Andy. So, I just came back from Japan meeting some with some people who told me repeatedly that our health system is vastly inferior to theirs, and actually to many around the world. How did that happen? Because ten years ago, we heard we have the greatest health system in the world. AS: What I find very striking, and I think we've both talk about this, is we underinvest in keeping people healthy. We underinvest in primary care, and we over-invest in having people show up once they're past the point of treatment. Furthermore, the rest of the world would argue, overinvest in social services, and I think that really pays off. Now, we're looking for quick fix solutions. There are none. If we really are serious though, what I believe we have to understand, is that we have to solve the root cause of the problem. I'll put it in the context of innovation. So, I've had a chance to have people show me a lot of different things since I've left, and people know the things that I'm most interested are innovations for vulnerable populations. The other day, I won't mention the name, but have you all ever passed through a drug rehab clinic in the middle of the city? Where lining up outside are people that are strung out, and homeless, and it's a pretty abandoned building. It's a pretty tough part of town. Well they're building clinics, clean, beautiful, great experience. When people are inside they're talking to them about their housing situation, about employment about social needs, and it's a totally different experience. This is a commercial for profit kind of company and idea, but they're going at the root causes. They're taking the same money, probably from Medicaid, or from the commercial pair. From wherever they're taking it from, and instead of just focusing on the services, getting people in and out, they're actually going at root cause. Root cause problems. I don't see how we get there if we're not willing to expand our thinking beyond just providing services to go all the way upstream to look at the all the causes. That's going to mean looking at average childhood events. It's going to mean looking at making sure we reduce unwanted pregnancies. Our country has to be able to afford to invest in those things in my view. 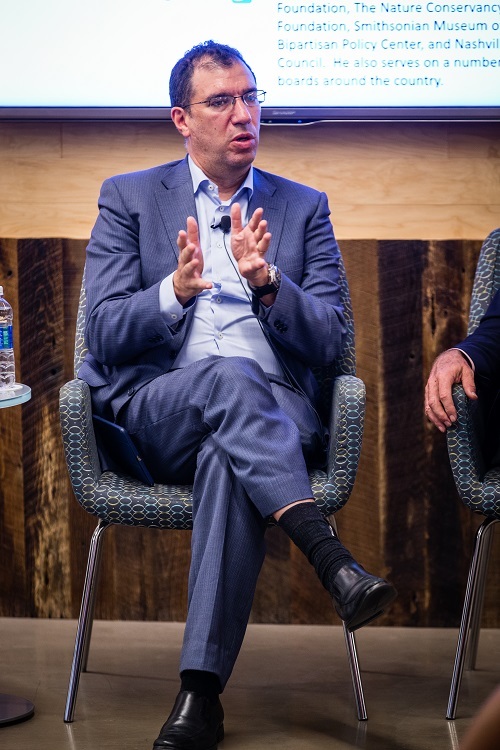 "Let's innovate and let's use technology, but equally important, it's going to be smart investment in communities in the social determinants of health." BF: I'll just be real quick. Number one, the social contract of Japan and other countries that I mentioned earlier, from a—forget health care—from a social, moral, health care equity standpoint is greater. All sorts of reason on the founding of America, and the pioneering spirit, and the independence and all that, is just greater. So, that's number one. Number two, health of the population is only sort of 15 percent determined on insurance, hospitals, doctors, delivery. And the big thing is obviously the 40 percent behavior and you got the 30 percent genetic. With Japan, there's probably a difference there, in terms of living longer, is probably in part genetic, and 15 percent environment and like. But you look at the health care system. We spend twice as much and we only have outcomes half as good. So, then you have to look at the social determinates. The 40 percent of behavior, that's exactly as Andy said, and the data is this: for every dollar that we spend on the health care system, the insurance and the doctors and all, other countries like Japan spend two dollars in social services, housing, education, food, safety issues. America, every dollar we spend, we spend 50 cents in housing. Homelessness is a walk around here, and food, and social determinates of health. So, my answer would be, yes let's pick the system. Let's get the equity there. Let's do the health care delivery reform. Let's innovate and let's use technology, but equally important, it's going to be smart investment in communities in the social determinates of health. Audience Participant: Hi, we have a question from one our live stream viewers. Three of the major drivers of health care cost in the US relate to the legal cost of medical practice, the soaring cost of a medical education and private interest in health insurance. How can we effectively begin to impact these three leavers when business interest and thus political interest are so heavily invested in them? AS: I take half of this question is how do we deal with the entrenched interest when we want to make changes, and I take the other half of the question is the sort of specifics, and all three of those are policy drivers. I wouldn't argue that were three of the biggest, but I would say psychologically tort reform is a psychological barrier. "If we need more geriatricians, which we desperately need, or psychiatrists, which we desperately need, we ought to be floating in that direction." BF: Is reform a major driver of health care cost you think? AS: I wouldn't call it major. BF: I would say no. Bet it'd be ten years it becomes a big issue, and it's not a big issue now. Number two ... What were the other things mentioned? BF: Yeah. Is it cost? AS: The cost of education. I don't know if that is a big cost driver, but I would say that we, the federal government spends a lot on it. We have to get what we pay for, and we ought to be making sure that we put people in places that we need them if we're going to pay for their education, and we have to make sure ... Look I'm not a big social planner type, but I do think we need more primary care than we ought to be setting policy that drives us in that direction. If we need more heart and lung surgeons, we ought to be setting ourselves in that direction. If we need more geriatricians, which we desperately need, or psychiatrists, which we desperately need, we ought to be floating in that direction. BF: And I'll basically say, we are educating the wrong kind of physicians today. The fact that we are even talking about physicians is a mistake because we need to look at nurses who are out there today. We know we are about 100,000 primary care physicians short of the next ten years. So, somewhere policy has to make that decision. Again, you don't want to do too much, sort of architectural control from above, but policy makers have to address that. Number two, we need to make sure that we don't have such rigid definitions that people can't really practice up to what they're licensed to practice. That means doctors have to turn over some of these traditional controls to other personnel, to community health workers. Empower people who can do jobs that historically doctors, had said, no, that you can't do. I don't think that's a big overall cost driver, but in terms of reform within the system, there's huge reform that needs to be done. "You just want to stop and say, 'Hang on a second. Just tell me what portion of the problem is your fault?'" AS: Let me just add one thing, which is the other element of the question. Which is, how do we deal with entrenched interest when we make changes? AS: Okay. I don't know if you had this experience, I had it in CMS, probably every day. Somebody will come into my office, or an outside meeting, they'll either be from the hospitals or the pharmaceutical industry, they'd be from the health plans, and I'd spent my whole career in the private sector, so, I knew from where they were coming. They would explain to me in the most articulate way possible, how everything that was happening was somebody else's fault. If I was talking to a pharmaceutical company, they were able to tell me the health plans were at fault and the hospitals, and the drug programs at the hospitals were terrible. Doctors, is the same with hospitals. Hospitals, is the same with doctors, and health plans and everybody with health plans. So, by the time you get through with these meting one cycle through, you just want to stop and say, "Hang on a second. Just tell me what portion of the problem is your fault?" We are very good at protecting our own interest, and I think once ... I find that once we make a dollar in whatever industry we are in health care, we feel we are entitled to it. Which is only going to do what? Drive cost up because you can't take a dollar away from anybody, and people are good at protecting and fighting for it. "If you have that continuity there, you have somebody to talk to you. You've had a discussion. You don't rush back into the hospital in the middle of the night. That's not necessary." Audience Participant: I want to thank you both for being here today, and want to thank Senator Dr. Frist for your discussion about social contract, and my question is, two-part question. The first is do we need to have the conversation about two things, one, I believe that there's a political divide between a discussion of, "Is health care a right? So that's the first question, and the second one is, "When will America be mature enough, or able to have a discussion about, what amount of resources do we want to put into end of life care?" Which I've seen in hospital work is a tremendous percentage of our health care delivery cost. BF: The end of life issue is huge, and you're the expert here, but probably of the Medicare dollars that Andy was responsible for, probably 30 percent, you can correct me on the last year of life, but something like that. So, you have of Hospice is that people get there for the last seven days of life, and the expenses are in the last eight months of life. It should be 40 days, is probably appropriate care for those who are in hospice, but it doesn't happen. So, really you start looking at the palliative care world. On average the nine months of life in the Medicare population cost about $68,000. Over like this on average, some are millions and million, and millions, but the people who end up in hospice, if you look back the $68,000, appropriate care with better outcomes when it's measured, higher satisfaction rates, more appropriate discussions, and you have documents filled out is about $32,000 – $33,000, appropriate care. So, it's not so much to just the discussion, should we not spend money at the end of life because the money is being spent because it's being wasted. It's chaotic. It's 13 different prescriptions. It's in and out of the hospitals in the middle of the night. There's no continuity of care there, but if you're changing the system, such you give a higher quality, a higher value of care, and the data is just want I gave you. It's about 50 percent. Why? Because if you have that continuity there, you have somebody to talk to you. You've had a discussion. You don't rush back into the hospital in the middle of the night. That's not necessary. You don't have to go to that. At least that's just the way I think about it. AS: Well, plus all the money it cost to pay the death panels. They're expensive. BF: Yeah, and the death panel discussion was an interesting discussion, and it killed the palliative health care field for ten years. AS: So, its interesting, as you may have remember, we introduced the first code to pay people to have discussions. This first step, but the discussion inside, I remember we went and we wrote something out, and we had done it well, and people in HHS desperately wanted to do this. Everybody was told, "Look when you do it, we're going to take such huge political heat in the White House." So, we came to the White House, after we did something, I forget what it was, it made them very happy. We'd just done something it made them very happy. BF: This is just all reimbursement for the discussion about end of life issues. AS: This is just ... Yeah. Exactly, so a doctor could have a conversation, and they said, "You did a great job on this. Thank you," and Secretary Burwell said, "We want that code." They said "Okay, you could give it a shot.". AS: The code that we could reimburse for, which was essentially people we going to view as the tempest in the teapot, or what have you. It had got things rolling, but what's interesting to me is, that's just an anecdote, we spend one percent of our GDP in the ICU. One percent of our GDP, and we've all had love ones in the ICU. It's not a place you want to die, it's just not. So, the thing about those numbers, you think about that experience, you think about that focus, it's exactly right. So, the other question about, should health care be a right is interesting because the country, without knowing it, has been having that debate over the last 6 to 9 months. I could tell you how often I hear the conversation, and get asked to talk about that question. "We ought to be smart about it, if we really want it. We ought to be having a dialogue about what it is we want." I was on a right-wing radio program the other day, with a right-wing radio host. This is how he describes himself, so not being disparaging in any way. He says to me during a commercial break, "I'm for single payer." He said. "I'm so sick of this." He said, "Now that I know, all of the hands in the pot, all that stuff, screw it. I'm just for single payer," he said. "And I'm about as right wing as you're going to find." Something else always sounds better when we're looking at the problem we're looking at now. Okay. So, so, let's just be little bit sober by the fact, and I always think it's good to remind people that we have to find a way to pay for the things we want, and that may change people's minds. "Do you like single payer and this tax increase?" I think that's a fair thing to ask people, but here's the opportunity. Here's what I like to see happen, I'd like over the next five to seven years, because I think it's going to be that long before having that happen at the actual level, two things happen. One is, at the state level we really try it out. We have a Medicaid buy-in opportunity in Nevada. The Governor almost signed, with some more real work with hospitals and others, possibly that could happen, it could happen somewhere else. So, we should try some experiments. See what happens. Stage level, I think we're stage four. The second thing is to get to a language that unites us around making how we think about health care in a universal way, rather than divides us. We ought to be smart about it, if we really want it. We ought to be having a dialogue about what it is we want. About what those trade-offs are, and what that language is, and what is it that we have a right to. I would say we have a right to a regular source of care, and to not go bankrupt when we get sick. I don't think we all have a right to every heart and lung surgeon, but I think there's something we do have a right to. I think that's the conversation that we let play out over the country. We should leave Washington the heck out of it, and then at some point in time, after we make some progress at the state level, the people who really care about this issue really want to see progress, we maybe will have built the foundation to do something more. JB: Well, we've come to the end of our time, and please join me in thanking both of our speakers here today. Both fit the service you've given to this country, as well as the time you spent with us. Thank you. 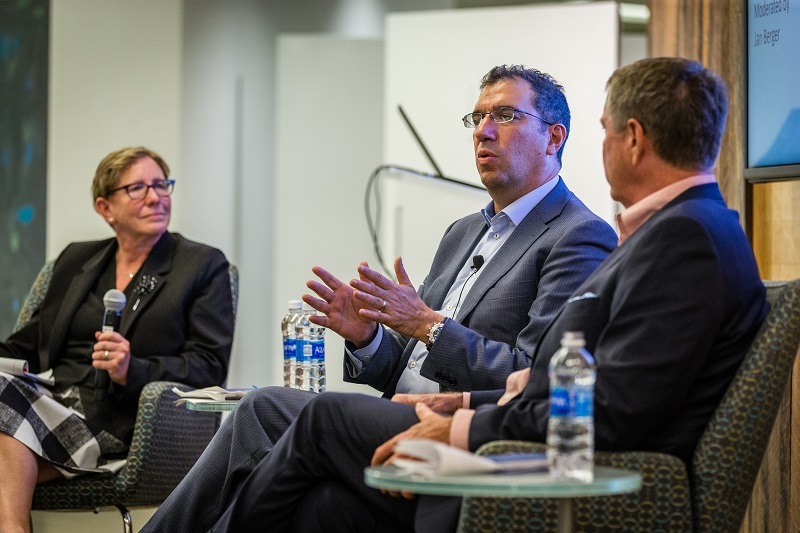 JS: That was Jan Berger, President and CEO of Health Intelligence Partners interviewing Andy Slavitt, and former Senate Majority leader Bill Frist at the Cambia Grove fireside chat on the future of health care. Thanks for listening to this episode of HealthChangers. You could find more information on all of our episodes at Cambiahealth.com. You could also follow us on Twitter @Cambia. Please subscribe to HealthChangers on iTunes or Stitcher, or anywhere you listen to podcast, and leave a review. Thanks for listening.